The chemicals that cause the burning sensation in pepper come from a family of compounds called the capsaicinoids, this family all have the same functional groups, only varying by the length of the hydrocarbon chain. Of all the capsaicinoids, only two compounds are responsible for 80-90% content of pepper, these are capsaicin and dihydrocapsaicin. Different concentrations of capsaicinoids give different pungencies and this therefore is the reason why some peppers are hotter than others. Capsaicinoids come from a larger family of chemicals called the vanilloids, compounds that contain the vanillyl group shown right. The only difference between capsaicin and dihydrocapsaicin is the presence of a carbon-carbon double bond. If capsaicin were subject to hydrogenation, dihydrocapsaicin would be formed. Capsaicin contains cis/trans isomerism because the double bond prevents internal rotation. Capsaicin is always found in the trans isomer because in cis, the -CH(CH3)2 and the longer chain on the other side of the double bond will be close together causing them to repel each other slightly, this steric hindrance does not exist in the trans isomer. This additional strain imposed causes the cis isomer to be of a less stable arrangement than the trans isomer. It is the presence of capsaicinoids that gives peppers their pungent flavour. The flavour of peppers varies with harvest time as the quantity of capsaicinoids increases during maturation. The amount of capsaicinoids also varies with species. Wilbur Scoville devised a means of measuring pepper ‘hotness’. He found some ‘mad’ volunteers to taste chilli powders on their own. The powders were then diluted down using sugar and water until they no longer burned the taster’s mouths. The more sugar that had to be added, the hotter the pepper. For example bell peppers were measured to be about 100 Scoville units, whilst the hottest known pepper was 577,000. 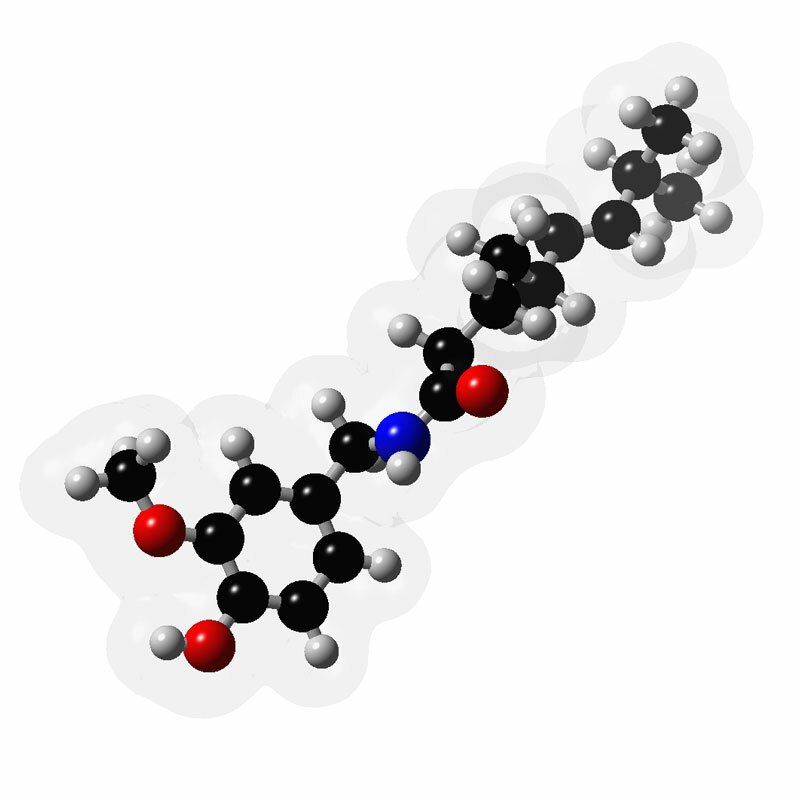 Pure capsaicin has a value of 16 million Sc.units. Capsaicin is soluble in fats and oils but not in water. Therefore milk, ice cream and peanut butter can calm the pepper whilst water will spread the flames!